In Self-Portrait (March 10 a.m.) I continued to document my lupus attacks. Any time I am having a lupus attack and feel up to making a portrait, I document the moment. 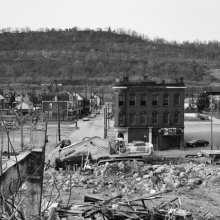 On this occasion I had just returned from clearing out my grandmother’s apartment in Braddock after her death. I only kept a few articles of her clothing. 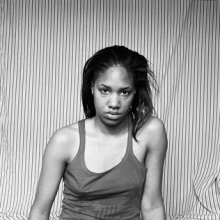 In this portrait I am wearing her pajama pants, and a bed sheet is duct-taped to the bedroom wall. 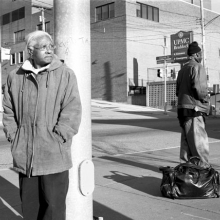 I found out in 2008 that both Grandma Ruby and Mom had cancer, as did many of the elder women in Braddock. Here, Mom and I explored a new approach to documenting our illnesses (mine being lupus). We stood our mattress on end and covered it with a comforter, essentially making it our studio/stage. We made a portrait of our bodies overlapping as one, unified in sickness, death, and our struggle to survive. The light cast a shadow that for me foreshadows the loss of Grandma Ruby; she passed away six months later from pancreatic cancer. 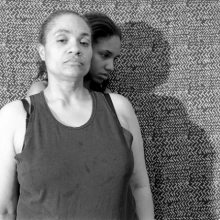 Frazier began to explore Braddock’s history in her series Notion of Family, four examples of which are on view in this exhibition. 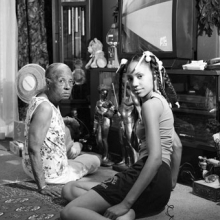 That project uses the bodies of the artist, her mother, and her grandmother both to reveal complex intergenerational relationships and to serve as a metaphor for their town’s decay. 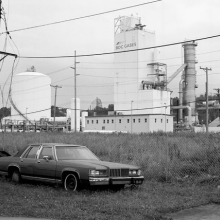 Frazier’s portrayal of this American landscape is in stark contrast to images from a recent corporate ad campaign set in Braddock, which she felt not only erased the troubled realities of her endangered town but also excluded the community to which her family belongs. 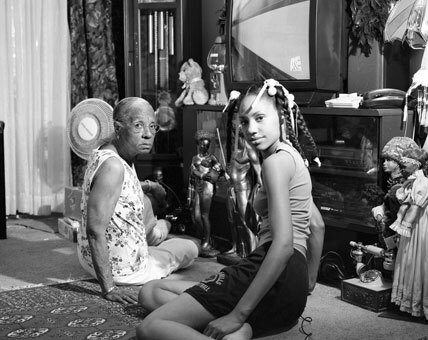 Frazier, whose work is featured in the 2012 Whitney Biennial, is Associate Curator for the Mason Gross galleries and teaches photography at the Mason Gross School of the Arts at Rutgers University, New Brunswick, New Jersey. 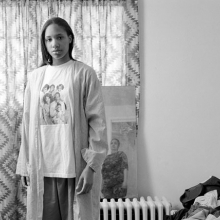 LaToya Ruby Frazier: A Haunted Capital was organized by Eugenie Tsai, John and Barbara Vogelstein Curator of Contemporary Art, Brooklyn Museum. Generous support for this exhibition was provided by the Lambent Foundation and the FUNd.